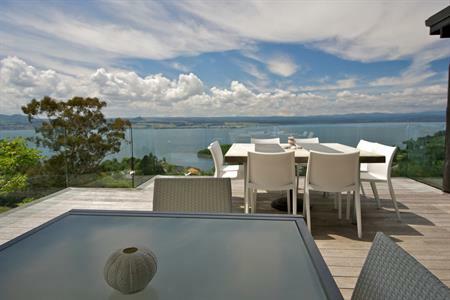 Stunning lake and mountain views and a simply spectacular Lake Taupo location. Acacia Cliffs Lodge offers luxury boutique accommodation in four super king guest rooms each with their own private decks and en-suites. 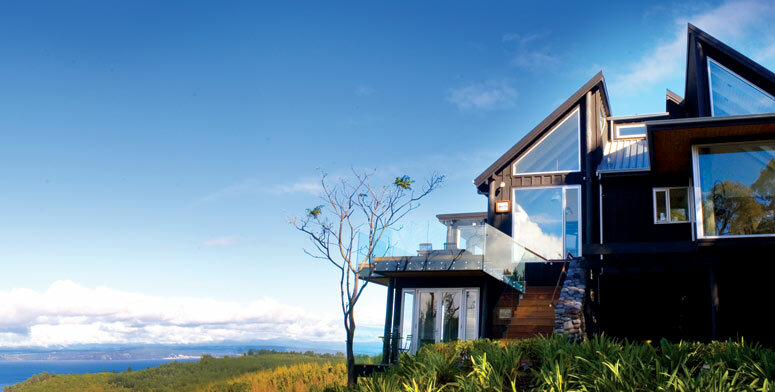 Enjoy spectacular views from your own private deck, indulge in superb cuisine and experience relaxed NZ hospitality in secluded natural surroundings with the regions’ world class activities right on your doorstep! Acacia Cliffs Lodge can be booked on a per suite or exclusive use basis and accommodates eight guests in four luxury ensuite rooms which have been designed to ensure your privacy and comfort and to take advantage of the stunning views and location. Each room opens out to its own large private deck or courtyard and is furnished with luxurious linen, duvets and throws on superking/twin beds. Curl up with a book and listen to the sounds of the bellbirds and tuis, play a favourite CD or DVD, or enjoy the in-room New Zealand wine, tea and gourmet coffee from your mini-fridge. 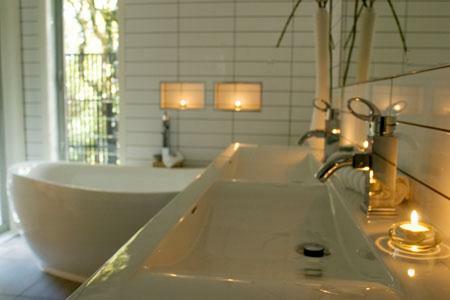 The fully tiled, spacious modern ensuites are equipped with luxurious personal toiletries, bathrobes and slippers, heated towel rails, underfloor heating, hairdryer and double basins and shower. For those who need to keep in touch with the world, each room has broadband and wireless internet access. Your hosts Rick and Linda’s interest in food and wine has taken them around the world and fuelled their passion for sourcing and using the best New Zealand has to offer. Enjoy a sumptuous gourmet breakfast as the sun streams in over Mount Tauhara watching the changing colours of Lake Taupo and the mountains. Each evening you are invited to join your hosts and other guests for complimentary drink and canapés around the fire in winter or in the late afternoon sun on the spacious decks in summer. Selections change daily and are matched with iconic New Zealand wines. For dining out, Taupo offers a wide choice of wonderful dining options only a few minutes drive from the lodge. 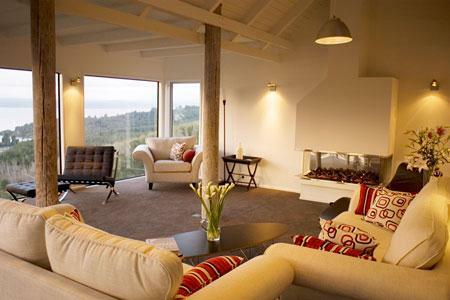 Experience genuine Kiwi hospitality in very special NZ surroundings - the perfect romantic hideaway or retreat. 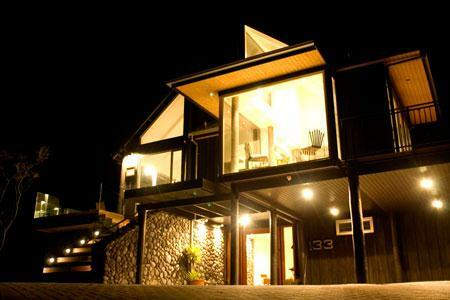 Rates are charged per suite per night and are quoted in NZ dollars (NZD). Rates include GST (Goods and Services tax of 15%), accommodation, gourmet breakfast, pre-dinner drinks and canapes and full use of all lodge facilities. Please note we require a deposit of 50% of the total stay, secured by credit card. We accept Visa, Mastercard, and AMEX. The balance is due on check-out, together with any other sundries. Please note: Cancellations received 30 - 15 days prior to arrival date are subject to a cancellation fee of 50% of the total booking. Cancellations received 14-0 days prior to arrival date are subject to a cancellation fee of 100% of the total booking. No shows incur a cancellation fee of 100% of the total booking. Acacia Cliffs Lodge will confirm all amendments and cancellations in writing. We would advise you to take out travel insurance. We welcome children 12 years and over. If you are travelling with children younger than this we require you to contact us prior to booking to confirm suitability and availability. As we are a boutique property of only four guest rooms we need to consider the comfort and privacy of our other guests.